SVS PC-4000 Subwoofer(black)(each) SVS PC-4000 Subwoofer(black)(each) - $1,425.59 : New Audio & Video, New Electronics at Lowest Prices! With a footprint measuring just 16” in diameter, the PC-4000 is the pinnacle of SVS’ iconic cylinder subwoofer designs, achieving unparalleled low frequency output and deep bass extension down to 15 Hz. 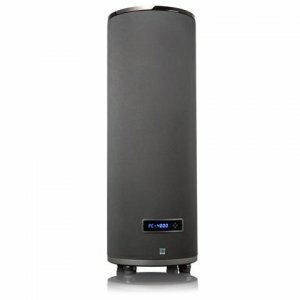 The unique form factor uses vertical height to add cabinet volume while a high-excursion, down-firing 13.5-inch driver and 1,200 watts RMS, 4,000+ watts peak power amplifier delivers concert and cinematic level bass with pinpoint control and accuracy to amaze serious home theater fans and the most discerning audiophiles.